What fraction of those using Express Lanes at UK immigration have to see an officer? This will make the Registered Traveler Program redundant for citizens of the countries mentioned. What are the statistics for the current program, namely; What percentage of people who try using it are rejected and have to go see a human immigration officer & current average queue times for people using the express lanes. The system is monitored by Border Force officers and anyone rejected by the gates will be sent to an alternative channel to have their passport checked. Blogger Kevin, host of Economy Class and Beyond on Boarding Area addressed much of this in his 9 January 2019 article (excerpted). The ePassport infrastructure is an important method of clearing passengers into the United Kingdom, with it being the primary method of clearing a European Union/European Economic Area and UK Citizens quickly. But I’m sure we’ve witnessed more than one rejection from the ePassport gates (and have suffered the process more than once). 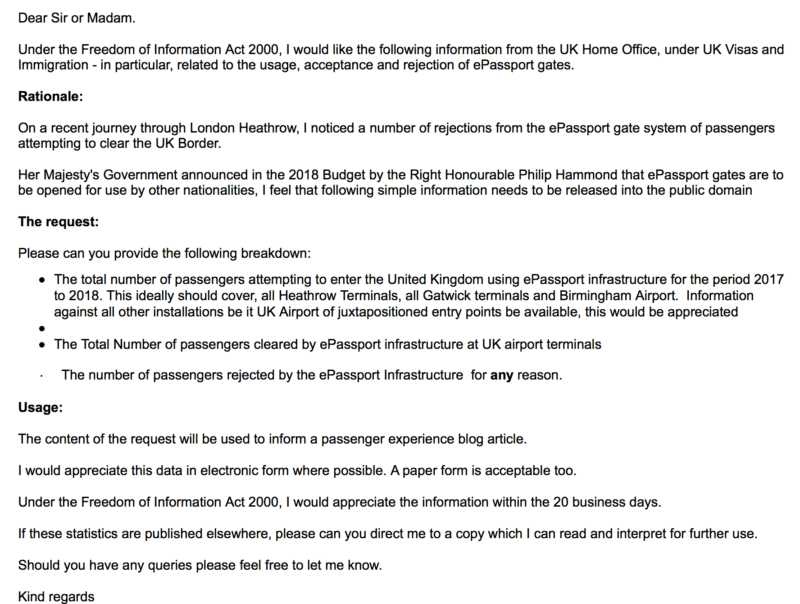 That led me to compose a Freedom of Information Act Request to the UK Border Agency after going through more than a few rejections in 2018. Here’s the actual data provisioned – with a net 10 million user growth between Fiscal Year 2016/17 and Fiscal Year 2017/18. How many people were successful vs being rejecting using the ePassport gates? "The information is exempt from disclosure under section 31(1)(a) and (e) of the FOI Act. Section 31(1) (a) and (e) provide that information is exempt if its disclosure would or would be likely to prejudice (a) the prevention or detection of crime and (e) the operation of the immigration controls." So it seems the UK Border Agency – whilst happy to share the numbers going into the gate system, aren’t so happy to share the actual accept/rejection rate. "Border Force recognises that there is a general public interest in openness and transparency in all aspects of government. The release of information about unsuccessful E-Passport Gate transactions would help inform the public debate about the effective use of technology and the resilience of our UK borders. This information would help build greater public confidence in the operational measures undertaken to ensure that passengers are cleared at the border within the agreed service level agreements." "In this case Border Force has determined that providing the information would provide potential criminals with an insight on the technology used and the reasons some passengers are unsuccessful in the use of that technology. This, together with information obtained from other data and FoI requests, would provide useful information, especially to organised criminals, to increase their chances of circumventing UK immigration controls. There is clearly a strong public interest in doing everything we can to detect and prevent crime and protect the public at large. Disclosing the requested information would not be in the public interest as it could impact on the abilities of the police and Border Force to protect the UK border and ensure the proper operation of customs and immigration controls." "Protecting the UK border is, and always has been, of paramount importance to this Government. It has never been government practice, for reasons of national security, to comment on operational issues relating to border security. This includes offering commentary on the performance of border systems and of ePassport Gates specifically." So no, whilst the numbers are good, releasing the information could lead to unintended and criminal use of it. If you choose to believe that – is of course – another thing entirely. Editorial note: as a courtesy, I've emailed Kevin since the entirety of this content is the intellectual property of blogger. I recently queued with a couple of hundred other people to get through the ePassport gates when returning to the UK. I was surprised at the number of people being told to 'seek assistance' by the gates, I'd guess it was between ten and twenty percent. Now this is one person standing in a particular queue on a particular day. It's anecdotal evidence only, not part of a systematic analysis so make of it what you will. It did really, really surprise me that the system was failing so many epassports though. Until recently it was nice to use the epassport lane and bypass the huge queues in the manual lanes. Recently however, everyone seems to have to use them and they are slower per gate than dealing with a human being. I don't remember noticing very many failures when there weren't so many people using the gates. Does the immigration officer know about our travel plans? Do I need to show a return ticket to the immigration officer in UK? Can a UK Immigration Officer cancel leave to remain?